When Aries and Libra fall in love, great balance can be achieved despite being directly opposite one another in the Zodiac. Each has qualities that the other lacks, so they are able to complement each other. Aries is impulsive, excitable and gung-ho about anything new and interesting, while Libra is indecisive, peace-loving and prefers a methodical approach. Aries can learn from Libra that their own way isn’t necessarily the only way. Aries is a Fire Sign and Libra is an Air Sign. Air fuels Fire and helps it grow and spread. Aries can have a very positive effect on Libra’s growth, ideas and progress. Aries can influence Libra put their ideas into action. Working together can be challenging at times though because Aries’ fast-paced, impulsive approach to projects may conflict with Libra’s more balanced, logical approach. However, both Signs have wide-range of interests, and at the end of a long, active day, Aries can come home full of interesting stories to tell the more intellectual Libra! Aries and Libra are both Cardinal Signs. They both have a lot of initiative — but lack in follow-through. They both tend to initiate startups that they’re never going to finish, whether it’s a job, a project, a relationship … Aries will appear to be the leader because of their energy and aggressive nature, but Libra leads from an intellectual standpoint. Both Signs want to be in charge, but Aries can be too pushy and intimidating to get what they want while Libra uses charm and diplomacy. Libra is ruled by Venus, the goddess of love while Aries is ruled by Mars, the god of war. This combination has the potential to work and last. Given their polarities, there will be challenges ahead but for as long as Aries can tone down his “take charge” stance and allow Libra to take the lead from time to time, this relationship will do just fine. Stubborn Aries must learn to welcome balance in his life, something that Libra can certainly deliver. Libra woman is charismatic and captivating, drawing people to her naturally and easily. She will find it easy to capture the heart of the Aries man, and he will delight in her outgoing nature. She is a born romantic, and will be drawn to Aries’ charms and impressed with his generosity. She responds instinctively to his needs and will always put her Aries guy first. She may have to adjust with his independent streak, since the Libra woman desperately wants to settle down forever. 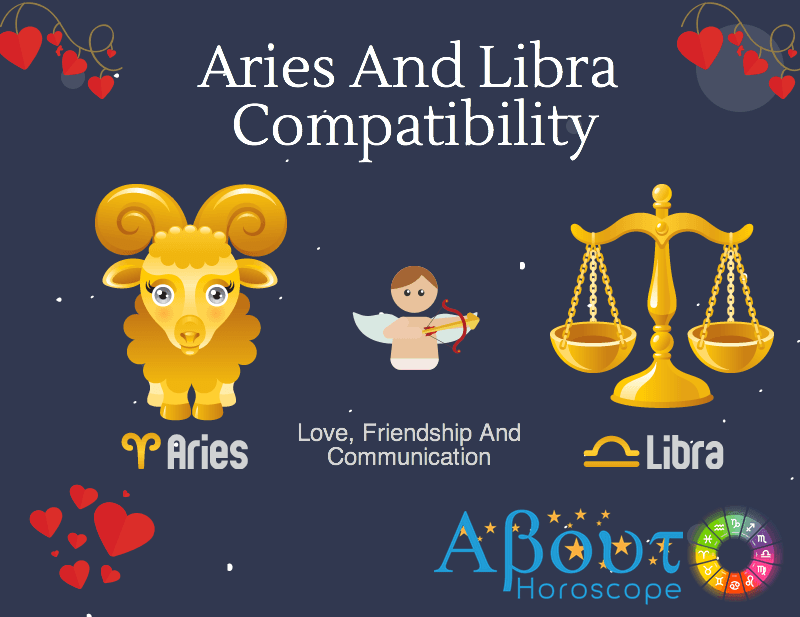 Known to be loyal, she may also be annoyed by the attention he gets from women – but truth is, the Aries male is rarely unfaithful once he’s found “the one” and Aries man and Libra woman compatibility is very strong. The Libra woman is idealistic in love, and probably feels that this alpha male is her perfect lover. The Aries man will enjoy his Libra lady’s intellect and social graces, and there will be a good bond of friendship here. Both Aries man and Libra woman love to lead their own way. A relationship will never work when there’s a constant battle over control, they’ll have to learn to be equals. Aries are not attracted to weak partners despite their reputation of being dominant. They typically do best with an equally feisty and confident lover. However, the Libra woman should not try to manipulate the Aries man quite often because he can easily gauge her intentions and this will turn him away. The Aries woman becomes a very stimulating partner for Libra man giving him mental challenges he needs to keep himself tuned. As both are kind and friendly, it helps them to build a strong foundation for their relationship. She always tries to balance things for him and go out of proportions to support her man in every field of life. The Libra man provides balance in his as well as his Aries woman’s life. He has a firm grip on his lady with all his intellect, senses, optimism and appealing charisma. Tact and courtesy comes naturally to him, which makes her feel more warm and feminine with him. He shows her that she is irresistible and makes her feel desirable. But the outspokenness of the Libra man can spark irrational outburst of the Aries woman. She must understand that when in a Libra man argues with his lady love, the only goal of the Libra man is to gain peace, agreement and not to offend. For him it’s not about winning or losing but all about balance and harmony. As he is a master of diplomacy, he can usually calm down his Aries woman. But if similar situations arise frequently, it can take its toll on both of them. The Aries and the Libra bring together a surprising combination of Fire and Air. The attraction they feel for each other can be very strong, mainly because each seems to offer what the other lacks. Aries and Libra in partnership could be a Herculean one, because it is too complex and difficult. When their differences in views and methods clash, both of them should learn to listen and give way. In this case, Libra will be in charge of keeping the peace in the relationship. Compromise is essential to this relationship’s health. Libra, the peacemaker of the zodiac, has a much easier time with compromise than does Aries, who strongly dislikes yielding to another person, viewing it as submission. Libra may have to give in more often to Aries’ wishes in order to keep the balance in their relationship. To be able to live a life of happiness, Aries may need to abandon some of their aggressiveness and harsh nature; this little adjustment may help them to create a long lasting relationship with other signs. In all, Aries can be a strong other half of an enduring relationship.